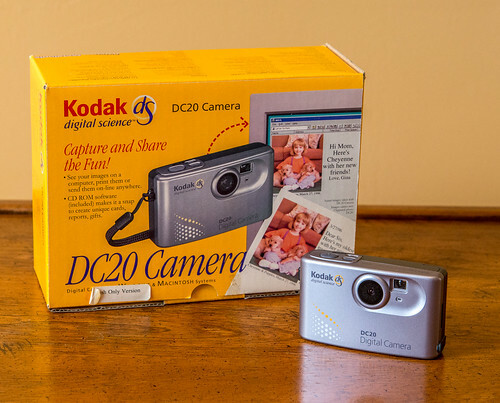 The Digital Science DC20 is a early digital camera marketed by Kodak in 1996. 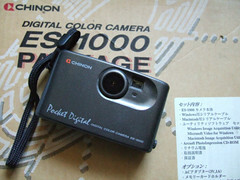 Since it was made by Chinon as an OEM model it was also available as the Chinon Pocket Digital ES-1000. It was released as a entry level digital camera. It features a fixed focus lens which has a range of 0.5m to infinity. Photos can be captured in 320 x 240 pixels or a higher resolution 493 x 373 pixels. There is 1MB of internal storage which can store 16 standard or 8 high resolution photos. 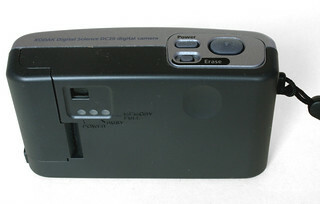 The back of the camera has three LED; for power, busy and memory. The memory LED will start to blink when almost full, with the number of blinks representing number of additional photos (3 blinks, 3 photos, 1 blink 1 photo, etc). When memory is full the memory LED stays lit. Holding the erase button deletes all the photos in memory. Photos cannot be selectively erased. Photos are composed with an optical finder, there is no LCD display for previewing photos. There is no flash or anyway to integrate one. Connectivity is with a serial port which can be adapted to 9 pin (windows) or din-8 (Mac). It is powered by a single CR123A battery. The camera will automatically turn off if inactive for 90 seconds. This page was last edited on 18 April 2018, at 17:25.